Using this poem as a starting piece, we made three books of linked verse. "The chestnut is a holy tree, for the Chinese ideograph for chestnut is Tree placed directly below West, the direction of the holy land. The Priest Gyoki is said to have used it for his walking stick and the chief support of his house. By men of the world. My verse is followed by a second and third verse, and we produced three linked-verse sequences. Ebara Taizô and other Japanese scholars interpret it as the aesthetic or artistic experience the speaker had when he stepped into the unexplored area on his journey. Some early Japanese scholarship has also suggested that the term fûryû here means the musical performance furyû, but this point of view is not widely accepted, as no solid evidence has been found that furyû evolved from rice-planting songs. Given its semantic complexities and compositional contexts, this poem in Oku no hosomichi poses intriguing questions to the reader. Either as praise of the host’s homeland or as an announcement of the speaker’s poetic quest, the poem has assumed a natural relationship between poetic quality and the rice-planting song in a rustic area. A question naturally arises as to what kind of poetry or poetic quality Bashô’s fûryû relates and designates. Fûryû is an important aesthetic concept in traditional Japanese culture, but the precise meaning of the term has been a complicated issue. It derives from the Chinese word fengliu.
. WKD : Ichihara Tayo-Jo 市原多代女 .
. yo no hito no mitsukenu hana ya noki no kuri . greeting for priest Kashin 僧侶可伸, and in memory of Saint Gyoki 行基菩薩 Gyogi Bosatsu. In the Tohoku region, where rice did not grow well, people had taken to plant sweet chestnut trees for food to survive the harsh winters. The MONO at the end of line 3 gives a strong impression. There is now a stone memorial at the temple Nenbooji 聯芳寺 Nenbo-Ji near Shirakawa.
. kuina tataku 水鶏たたく a Kuina knocks . 岸本調和 Kishimoto Chowa (1638 - 1715). 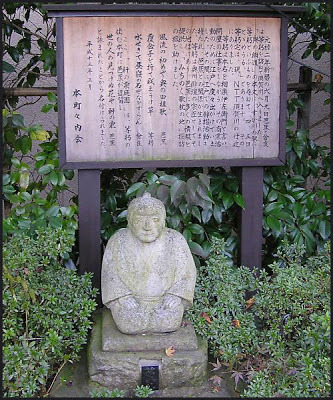 Basho stayed a few days at his home. In later years he had contact with 内藤露沾 Naito Rosen. One of his hokku collections is called Date-i 伊達衣. It is said that he asked Basho about his impression of OKU after crossing the Shirakawa barrier, and Basho answered with the above hokku about FUURYUU - the beginning of all art.
. WKD : taue uta, taue-uta 田植歌 song for rice planting .